December 18, 2009 - "It's an immense pleasure to see the EC175 soaring through the skies," declared Eurocopter CEO Lutz Bertling. 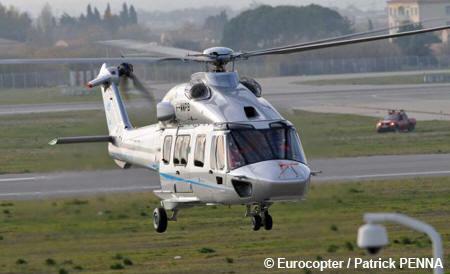 Eurocopter EC175 helicopter, the latest member of the Eurocopter range, performed its official maiden flight in the skies above Marignane on Thursday. At the controls were Alain Di Bianca, Eurocopter Experimental Test Pilot, as well as Michel Oswald and Patrick Bremont, Flight Test Engineers. Officials, industrial partners, launch customers and Eurocopter employees were all on hand for the event. This newest addition to the Eurocopter family in the 7-metric-ton class has been developed and manufactured in cooperation with the China Aeronautics Industries Group Corp. (AVIC), a longstanding Eurocopter partner. "This helicopter was developed in close cooperation with our customers to ensure it would be perfectly suited to their needs—particularly in terms of safety and comfort. This is the product everyone's been waiting for on the civil market. I would like to congratulate and thank our colleagues from China, all our personnel who invested so much time and effort in this project, and, of course, our industrial partners. Their combined efforts have made it possible for the EC175 to perform its maiden flight right on schedule, that’s to say exactly four years after the program was launched, which is a real technological wizardry. " The new generation EC175 has a multirole design and can carry out a wide scope of civil missions. It slots perfectly into the Eurocopter range between the AS365 Dauphin (4/5 metric tons) and the AS332/EC225 Super Puma (9/11 metric tons) families. It benefits from a mix of proven and advanced technologies, making it a very performing and reliable helicopter. Depending on its configuration, it can hold up to 16 passengers. A total of 114 EC175s have already been ordered by 14 different customers. Certification of the EC175 by the European Aviation Safety Agency (EASA) is slated for 2011, and the first deliveries are scheduled to follow in 2012. Eurocopter expects to sell 800 EC175s over the next twenty years, creating nearly 2000 new direct and indirect jobs. The EC175 program was launched on December 5, 2005. The helicopter was developed in cooperation with Chinese industry in just four years thanks to innovative new computing tools that offer major time savings. The work teams, separated by some 10,000 km, have been working together under the aegis of the French and Chinese governments. Their cooperation has been exemplary, and has benefitted from 30 years of close ties between the partners, first through the Dauphin and then through the EC120. During the development phase, an average of 50 Chinese employees joined their Eurocopter colleagues in France to define the helicopter's characteristics. Now it’s the turn of Eurocopter's employees to reciprocate, and a staff of 30 is currently on permanent assignment in China to assist the teams with design, quality, production and procurement work. The development and industrialization work has been equally split between Eurocopter and AVIC according to the specialties of each company. Two different helicopters will result from the common platform: The EC175 manufactured, sold and maintained by Eurocopter in Marignane and the Z15, manufactured, sold and maintained by the AVIC Group. The EC175 is a medium-lift twin-engine helicopter that can perform many different civil missions. Initially designed for the oil & gas industry to carry work teams to the platforms, it meets the strictest safety and availability requirements that have become a must for operators in the industry. The helicopter is also being developed for missions such as search and rescue and emergency medical transport, and can also meet the needs of the commercial aviation industry for VIP and corporate transport. The EC175 benefits from the most cutting-edge technology available. It is powered by twin Pratt & Whitney PT6C-67E engines with dual-channel new generation Full Authority Digital Engine Controls (FADEC). With its completely new avionics, the EC175 has an effective and easy-to-use man machine interface, which considerably reduces the pilot workload. Both the pilot and co-pilot can therefore concentrate more fully on their missions. The EC175 is indeed equipped with a full screen cockpit and a digital four-axis Automatic Flight Control System (AFCS) that outperforms any other automatic pilot system on the market. It also has a five-blade Spheriflex main rotor and an airframe that complies with the most stringent certification requirements. The EC175 offers the widest cabin of any helicopter in its category, which provides an unmatched level of comfort. The aircraft can be boarded easily using the wide sliding doors on either side of the fuselage and the immense baggage compartment is also accessible from both sides of the helicopter. All very large windows offer a great visibility and can be jettisoned so that passengers and crew can quickly exit the helicopter in the event of an emergency. The EC175 has also been designed to reduce vibration levels to a minimum; its blade design has taken forward the concepts that have proven so successful on the EC155 and EC225. Special care has been taken to reduce both internal and external noise levels to make the EC175 the quietest helicopter in its class, offering levels well below the limits recently established by the International Civil Aviation Organization. Established in 1992, the Franco-German-Spanish Eurocopter Group is a Division of EADS, a world leader in aerospace, defence and related services. The Eurocopter Group employs approx. 15,600 people. In 2008, Eurocopter confirmed its position as the world’s No. 1 helicopter manufacturer in the civil and parapublic market, with a turnover of 4.5 billion Euros, orders for 715 new helicopters, and a 53 percent market share in the civil and parapublic sectors. Overall, the Group’s products account for 30 percent of the total world helicopter fleet. Its strong worldwide presence is ensured by its 18 subsidiaries on five continents, along with a dense network of distributors, certified agents and maintenance centres. More than 10,000 Eurocopter helicopters are currently in service with over 2,800 customers in more than 140 countries. Eurocopter offers the largest civil and military helicopter range in the world.